In the poster, it is said: "We will not forget, we will not forgive"
In my last post, I wrote about free speech and censorship by focusing on J.S. Mill. This time I wanted to be more personal as it would also give me the chance to tell you where I come from. I am coming from Turkey, a country that consists of several different ethnic groups such as Kurds, Armenians, Greek, Jews, Assyrians (not Syrians) and many others which are "minorities" compared to the majority group - "Turks." I am not quite sure if there is anyone in HC that knows "some" things about the past or the current state of Turkey. Therefore, I wanted to give you an idea of how the right to expression of self has a consequence - the murder of a journalist in 2017. Since I am an Armenian Turkish, I will give example to this horrible reality by focusing on my community. To start with, I have to tell you briefly about "Turkification" policy carried out in my country so that you could understand the reason for the horrible event happened in 2017. Unfortunately, Turkey, after the establishment of the Republic in 1923, adopted an assimilation policy that we call Turkification. The background of the assimilation policy can be found in the books or on the internet which I will not write about as it is another huge topic. However, if any of you is interested in, I would suggest reading foreign resources, not Turkish ones since our books are full of nationalistic propaganda. So, as for assimilation policy, it was a big nationalist movement that denied and still denies the existence of other ethnic groups or their achievements, their work of arts and contributions to Ottoman Empire and Turkey. It is a policy that ignores "others" and educates its citizens about only what the state wants them to know. Why did I tell this? An ordinary Turkish citizen attends school (private or public does not matter), learns only what he/she is given, questions or discusses nothing. One day, he hears about an Armenian journalist who debates in TV about Armenians Genocide happened in 1915, or writes about Armenians' contributions to today's Turkey, or mentions about possible Armenian origin of a national Turkish hero. That journalist was doing his job and using his right to free speech and expression. 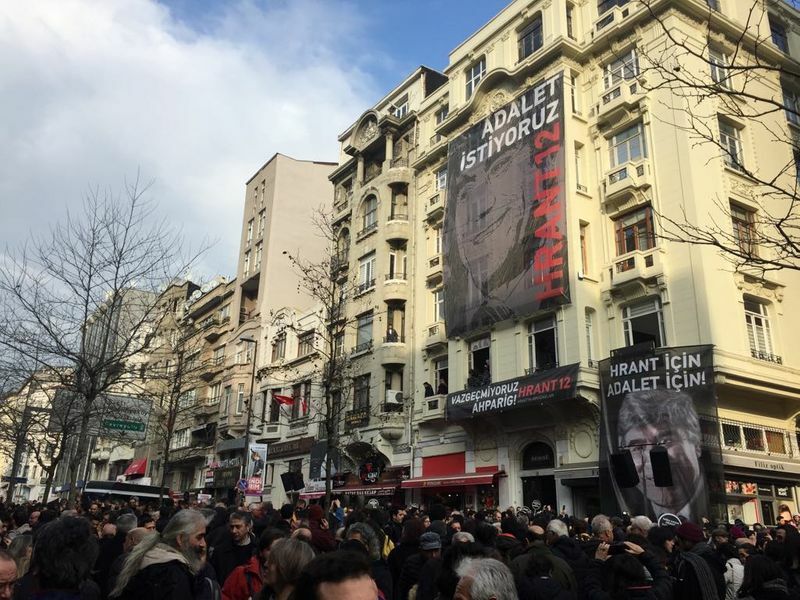 He was Hrant Dink, who was targeted by the media, received threats and had already been charged under Article 301. The article makes it illegal to insult Turkey, the Turkish nation, or Turkish government institutions according to the Turkish Penal Code. 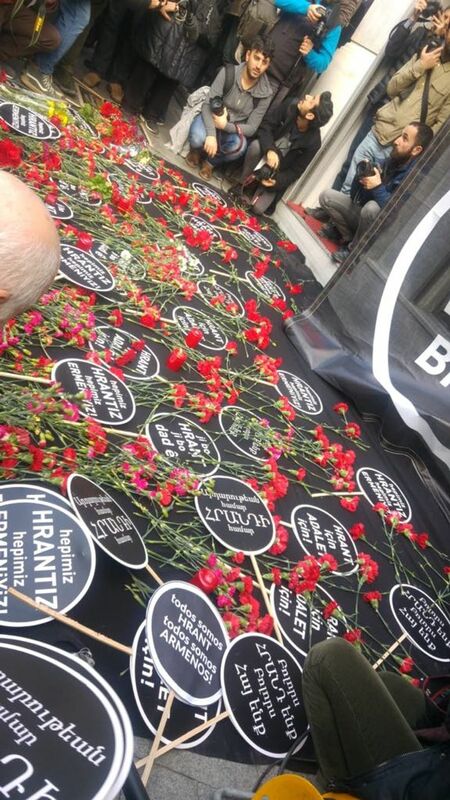 Nevertheless, this horrible event was a turning point for one of the minority groups in Turkey. As Armenians, for the first time, we strongly felt our existence in this land. Before, we were denied, our history was denied, just like other minorities. 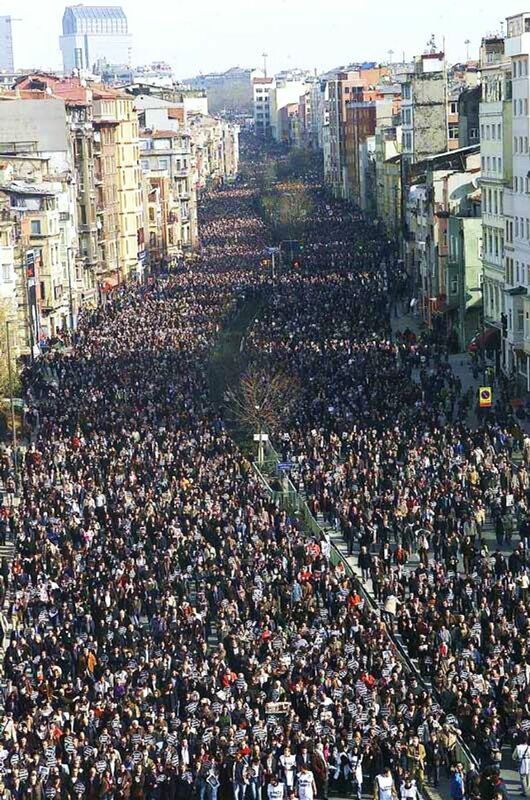 But in 2007, during the funeral of Dink, we were there with thousands of people from different ethnic groups - mainly Turks -, showing solidarity and chanting. It was then that many people learnt about a group of people that have been living in today's Turkey before even Turks settled in. Part of the crowd in 2007 just after Dink was murdered. In short, being a minority is hard, but being a minority in a so-called democratic country is harder. We fight not only for democratic values but also for the recognition of our identity. Therefore, I dedicate my post to all people who were murdered for the values they were fighting for. 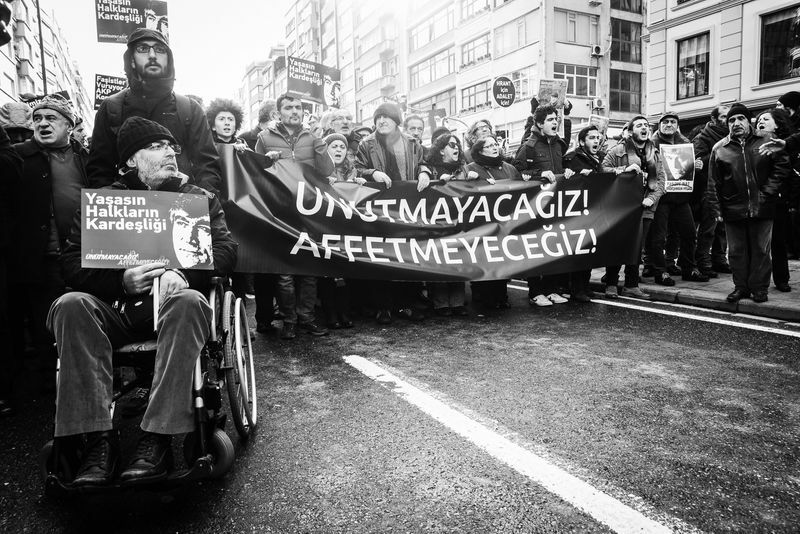 "We are all Hrant, we are all Armenians"
"We do not give up, brother"
"Long live the brotherhood of people"
There is nothing that tells more from a society, than how it treats the vulnerable ones. Thank you for bringing this to the attention of HC readership. Every part of the glorious tapestry of a nation - each individual and each group of persons - ought to be cherished. The genuine nature of that regard for diversity is tested whenever members of any minority group rise out to stake their claim as members of the national identity.